The biggest natural disaster to ever hit the Caribbean island of Dominica is now likely to provide guidelines for reducing the risk globally of disaster from hurricanes. Scientists led by disaster expert Dr. Richard Teeuw, of the University of Portsmouth, are surveying the damage to Dominica’s landscape, infrastructure and communities following the destruction caused by Hurricane Maria in 2017. Dominica was devastated by the hurricane last September which left 68 people dead or missing. The hurricane registered as Category 5 on the Saffir-Simpson scale, with maximum wind speeds of 260 km/h. The results of the surveys will provide guidelines for reducing vulnerability and exposure to hurricane-driven floods. Global warming is expected to bring a steady rise in the number of hurricanes and an increase in their intensity. The scientists are calling for urgent climate change adaptation strategies, particularly in small island developing states with limited financial resources. Dr. Teeuw said: “It’s vital we better understand the strengths and vulnerabilities of the built environment, especially critical pieces of infrastructure, and examine ways of increasing the resilience of affected communities. All the evidence points towards global warming bringing a greater number of the largest (Category 5) hurricanes. Dr. Teeuw and colleagues from the University of Portsmouth’s School of Earth and Environmental Sciences and Department of Geography, as well as geologists from University College London and civil engineers from Brunel University, were awarded £64,000 for the six-month survey by the Natural Environment Research Council (NERC). 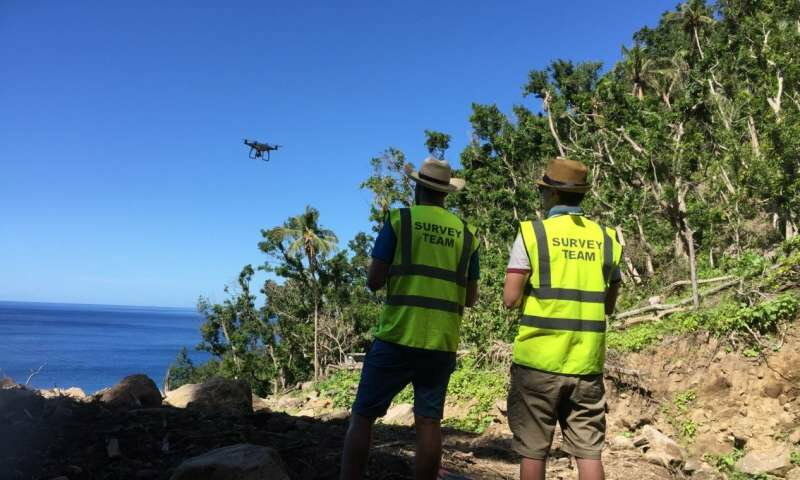 The project involves a multi-disciplinary team of geoscientists, engineers and community resilience specialists, with drones capturing photographs of survey sites. Working alongside the damage survey team, Dr. Carmen Solana of the University of Portsmouth and an expert in communicating the risk of damage from natural disasters, is studying the coping strategies and resilience of hurricane-hit communities. The hurricane destroyed the roofs of 98 per cent of the buildings and the structural frames of half of the island’s houses. In the immediate aftermath, electricity was cut and communications were down, many bridges were damaged and water supplies were disrupted by erosion and breakage of pipes. In terms of structural engineering, the hurricane’s effects on the built environment are among the worst reported ever worldwide from hurricanes. Survey target areas were selected after post-hurricane damage mapping, carried out using remotely sensed imagery from aircraft and Earth observation satellites, via volunteer crowdsource ‘mapathon’ events in the Caribbean and at the University of Portsmouth.